Home article Why Egyptians made mummies? Egyptians believed that a person's soul had many parts, and that all people and the parts of their souls were sculpted from clay by the ram-headed god named Khnum. One of these parts was called the ka. The ka was a person's double, sort of an invisible twin, which supposedly lived in the body until death. It was necessary to prevent the dead body from decaying because the ka still needed it! 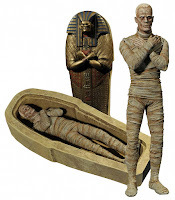 Sometimes a statue that resembled the deceased would be placed in the tomb with the mummy. These ka statues were a back-up, to make sure the ka had a body to belong to, just in case something should happen to the mummy. In addition to a recognizable body, the ka also needed food to survive. When Egyptians left food and water at the tomb, they were leaving it for the ka. Another part of the soul was called the ba. The ba was usually shown as a bird with a human head that looked like that of the dead person. Unlike the ka, which stayed in the tomb with the mummy, the ba was able to leave. It could fly out of the tomb, magically passing through walls of solid rock. But it always returned to the mummy at night. Like the ka, it could only live forever if it was able to find and recognize the body to which it belonged. And this wouldn't be possible if the body decomposed! This is why the Egyptians wanted to preserve the dead in as life-like a state as possible. 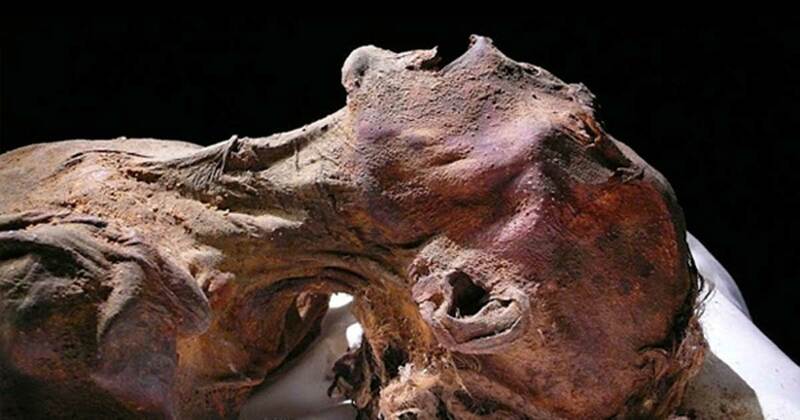 Mummification was the guarantee of eternal life. What isn't known is whether the Egyptians practiced mummification to support their religion, OR if they shaped their religious beliefs to go along with their desire for fancy burials, which relied on mummification. Early attempts at mummification were not successful because the coffin, bandages, and resin locked the moisture inside the corpse, making it rot from within. But making mummies turned out to be not so difficult after all-- the Egyptians improved on nature by artificially drying the bodies before sealing with resin. 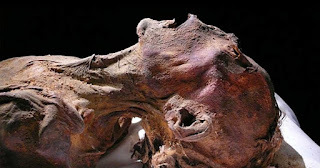 The entire process of mummification took 70 days to complete. Several well-respected embalmers conducted the task in a special enclosure called a per nefer. The chief embalmer was known as the hery seshta. He wore a jackal mask to represent Anubis, the god of mummification. Assistants called wetyw bandaged the body and carried out other tasks of the embalming process. After being delivered to the per nefer, the deceased was placed upon a slanted table. The first task that needed to be done was to remove the soft, moist body parts that would cause decay. As these parts were removed, blood and other bodily fluids trickled out and flowed down the table into a collecting bowl. During the Old and Middle Kingdoms, the brain was left in the head, but starting in the New Kingdom it was removed. The bone that separates the nasal cavity from the brain cavity was broken open by ramming a sharp instrument up the nose. Then, a long hook was used to stir up the brain until it was liquefied. By turning the body face down, the brain would spill out the nostrils. The Egyptians were so rough on the brain because they didn't realize its importance. They thought its purpose was just to produce snot! Next, some of the major organs were removed. One of the embalmers would use a blade made of sharpened stone or obsidian to make an incision in the left side of the abdomen. Although this step was entirely necessary to remove the organs, they didn't like it because it was considered sinful to "injure" a corpse. In mock ceremony, the other embalmers present would curse and throw stones at the man who made the cut. They didn't really try to hurt him, it was all just part of the ceremony. The stomach, intestines, liver, and lungs were removed and preserved by drying them in a special salt called natron. Natron is chemically similar to a mixture of table salt and baking soda. Originally dissolved in the ground water, it is found in clumps by oases where it gets left behind when water evaporates. After drying, the organs would be put in a four-chambered box. This box was stored in the tomb with the mummy. The Egyptians believed that all body parts would be magically reunited in the afterlife and the body would become whole again, just like the god Osiris. According to Egyptian mythology, the god Osiris was murdered by his jealous brother Set and hacked into pieces. The goddess Isis reassembled the pieces and Osiris was magically restored, and went on to become the god of the afterlife. In later times, it became customary to put each organ into a separate container called a canopic jar. During the Middle Kingdom, the stoppers of the jars were carved to resemble the face of the dead person. Later still, during the New Kingdom, the stoppers of canopic jars were shaped like the heads of the four sons of the god Horus. Each son protected the organ placed inside his respective jar. Duamutef, who had the head of a jackal, guarded the jar that contained the stomach. Qebehsenuf, who had the head of a falcon, watched over the intestines. Hapi, the baboon-headed son of Horus, protected the lungs, while human-headed Imseti was in charge of protecting the liver. Canopic jars were usually stored in a four-chambered chest that was later placed in the tomb with the mummy. 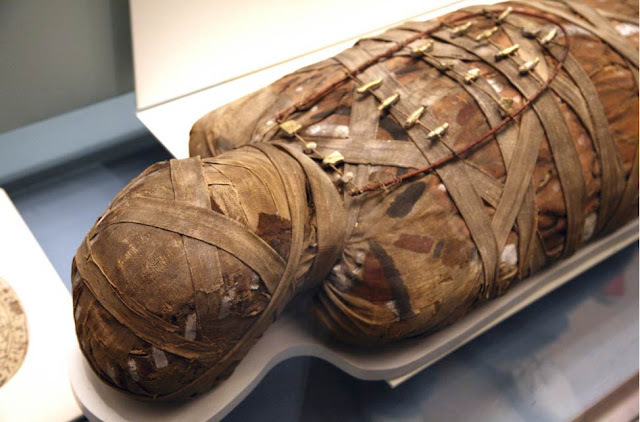 By 1000 BC, the preserved organs were wrapped in linen and placed back in the mummy's body, but the empty canopic jars were still placed in the tomb. After the organs were removed, the body was washed with wine and rubbed with spices. The alcohol in the wine acted as an antiseptic, helping to kill bacteria. The corpse was then covered with natron, where it sat for 40 days to dry out. Once dried, the skin was shrunken and leathery. The mummy was cleaned again and rubbed with sacred oils to soften the skin. In one Egyptian myth, the god Horus had his eye miraculously restored after losing it in a battle with the evil god Set. The eye of Horus, known as a wedjat, is associated with healing and protection. A wax or bronze plate with a wedjat carved into it was placed over the embalming incision to magically heal the mummy in the afterlife. Once the body was fully dried and cleaned, it was adorned with jewelry. Then it was covered in linen shrouds and bound with linen strips. Small magical amulets were inserted between the layers of the bandages to protect the mummy's spirit on its way to the afterlife. As each layer was added, it was coated with resin to hold the wrappings together with a waterproof seal.